The PN-65SC1 interactive touchscreen LCD monitor delivers innovation to the world of business and education. 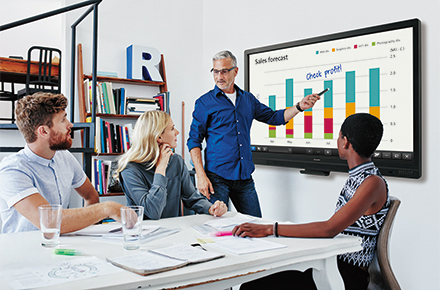 This affordable 65-inch model with the basic functionality of the Sharp BIG PAD series simply enhances your visual communications by transforming presentations, training sessions, or classroom lectures into creative and interactive experiences. Whatever the task, the PN-65SC1 helps you work more efficiently, smoothly, and productively. The user interface of SHARP Pen Software is simple to operate. It incorporates a menu comprising smartly arranged icons that make it easy to adjust pen settings and access various useful functions. In overlay mode, you can write onscreen annotations or graphics directly onto photos, videos, Adobe® PDFs, and common Microsoft® Office files. Text and graphics written on the board can be easily stored in USB memory* or sent directly via e-mail to selected recipients. The software links smoothly with the PowerPoint® application, enabling you to perform various control operations during slideshow presentations. The full-HD (1,920 x 1,080-pixel) resolution of the 65-inch LCD monitor ensures that detailed text and images are reproduced vividly and accurately. Even in bright rooms, screen content is crystal clear, so everyone can stay focused on the discussion. The PN-65SC1 is designed with your convenience in mind. Frequently used functions such as power on/off, input switching, volume up/down, and freeze buttons are neatly arranged on the front of the frame. Protecting the glass screen is an anti-glare film that works to reduce glare and reflections and minimise fingerprint soiling. Documents and teaching materials are easy to read even in bright lighting. With it’s curved corners, the PN-65SC1 has been designed with user safety in mind. Two handles in the rear allow for easy and safe transportation. The PN-65SC1 is compliant with the CUD (colour universal design) standard*, which specifies designs that take into account people’s differing colour perception abilities. * Based on regulations established by the Color Universal Design Organization (CUDO), a non-profit organisation in Japan. Scanned documents can be directly imported to SHARP Pen Software from a compatible Sharp MFP. Onscreen image data, including handwriting, can be sent to a PC for storage or to an MFP for printing. A web camera can be easily mounted on the top of the frame. Two built-in speakers (10 W + 10 W) let you hear audio information accompanying videos or other content. No external speakers are required. The PN-65SC1 can be used continuously for up to 16 hours per day, providing reliable performance in the office or classroom. Original Sharp software lets you manipulate a variety of different files on the screen without actually opening the respective applications. The files*2 are displayed onscreen as “sheets”, which can be stored in onscreen virtual “drawers”. This software brings convenience and originality to business meetings, in-store installations, and more. This software supports multifaceted wireless communication. 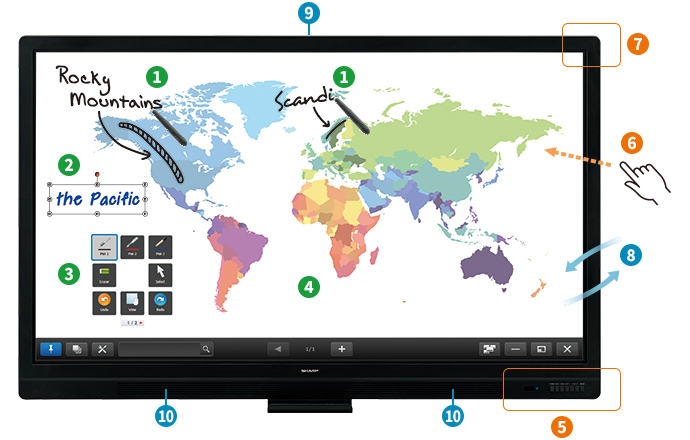 Content on the PN-65SC1 screen, including handwritten notes, can be shared simultaneously with up to 50 devices*3. Also, files can be exchanged between devices connected to the PN-65SC1. The Intel Mini-OPS Expansion Slot supports the optional PN-ZB03W Wireless Board. It allows up to 10 devices—including Mac® or Windows computers, smartphones, and tablets—to connect to the PN-65SC1 simultaneously without any cable hassles. You can display the content of one device on the whole screen, or you can display the content from up to four devices on a 2×2 split screen. 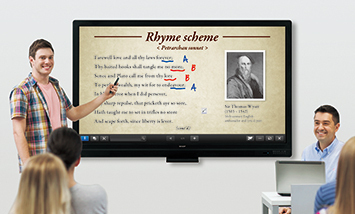 This wireless collaboration is a great way to enhance productivity in work or educational environments. *3 Please comply with the license agreements of your OS and installed applications. OS requirements (as of March 2017): Host: Windows 7, Windows 8.1, Windows 10; Client: Windows 7, Windows 8.1, Windows 10, Mac OS X v10.7, v10.8, v10.9, v10.10, v10.11, macOS v10.12, Android™ 2.3–7.1, iOS® 6–10. Connecting 26 or more mobile devices requires at least two LAN access points.